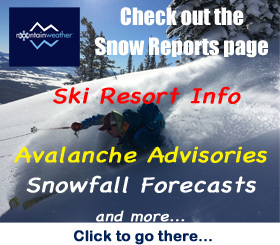 This forecast displays data for both the Jackson Hole Valley & the Teton Mountains @ 10,000-ft. The National Digital Forecast Database (NDFD) from the NWS is utilized for the base info. 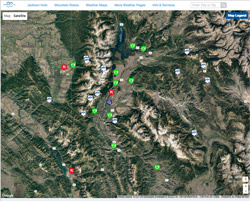 MountainWeather™ then adds value to this data, using 25-years of local forecasting experience. Sunny, with a high near 55. West southwest wind 5 to 9 mph. Partly cloudy, with a low around 32. South southwest wind 3 to 9 mph. Mostly sunny, with a high near 59. South southwest wind 3 to 14 mph. Partly cloudy, with a low around 39. South southwest wind 3 to 12 mph. A chance of rain showers before noon, then a chance of showers and thunderstorms. Mostly cloudy, with a high near 55. South southwest wind 5 to 12 mph. Chance of precipitation is 50%. A chance of showers and thunderstorms. Mostly cloudy, with a low around 37. Southeast wind 6 to 13 mph. Chance of precipitation is 40%. A chance of rain showers before noon, then a chance of showers and thunderstorms. Mostly cloudy, with a high near 48. Northeast wind 5 to 8 mph. Chance of precipitation is 50%. A chance of rain showers before 1am, then a chance of rain and snow showers. Mostly cloudy, with a low around 34. Chance of precipitation is 40%. A slight chance of showers and thunderstorms after noon. Mostly cloudy, with a high near 51. Chance of precipitation is 20%. Red Line is for Valley Temps, with the value for the daily high plotted each day on the graph for a quicker read. Blue Line is for Mountain Temps at the 10,000-ft. elevation. The freezing point line, 32F (0C), is also highlighted. NOTE: Hover over graph to reveal more details. This graph shows the trend in wind speed and direction at Ridgetop level in the mountains, generally up around the 10 to 11,000-ft. elevation. Green Line is the trend of maximum average speeds to expect up in the alpine zone. Dark line plots the maximum wind gusts expected. This graph shows the Potential for Precipitation and the possibility of Lightning. Orange Line represents the percent chance of Rain &/or Thunderstorms occurring in the mountains. May be greater some days than in valley. Orange Bars represent the amount of Lightning Activity expected with any T-storms that might form. This can also be an indicator of the potential severity of T-storms, when precip potential and lightning activity are both high. AM covers the time period between Midnight and Noon (overnight and early morning hours). PM covers Noon to Midnight (afternoon and evening hours). LOW= a few strikes possible. MOD= several strikes probable. HIGH= Numerous strikes expected. N/A denotes that no forecast data is available for that time period. This graph shows the average expected snowfall amounts for the next 4-days in inches, broken down by DAY & NITE. Snow accumulation during DAY is from 6am to 6pm. NITE is from 6pm to 6am the next morning. Gray bars are for valley snowfall amounts. Blue bars are for mountain snowfall amounts at around the 9,000-ft. elevation in the Tetons, with value plotted for a quicker read on mountain snow amounts. NOTE: Read chart descriptions for details about data displayed in the graphs.